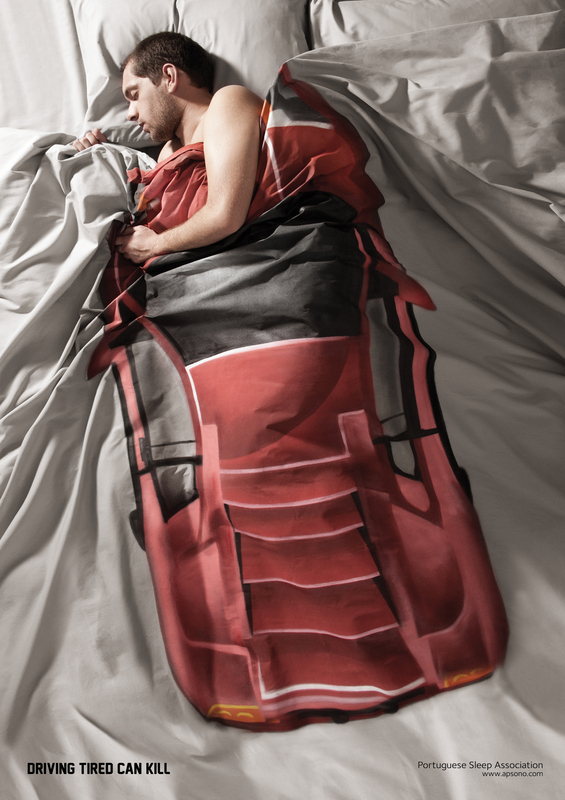 Portuguese Sleep Association (Associaçao Portuguesa do Sono) is running a print advertising campaign featuring sleepers wrapped up in cars. The text, in English, “Driving Tired Can Kill”. The Driving Tired campaign was developed at Fischer+bus, Lisbon, Portugal, by creative director Paulo Afonso, art director Marcelo Melo, copywriter Nuno Leal, account manager André Rasteiro, with photographer/retoucher Claus Stellfeld, producer Alexandra Dias and Andreia Nunes, make up artist Erica Porru, models Rudolfo Teixeira and Maria Alcobia, illustrator Smile.